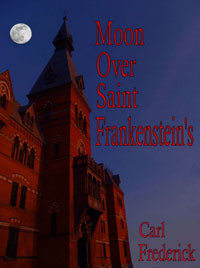 St. Friard's, a boarding school in the wilds of northeast Australia has two student populations: locals from rural Queensland, and foreigners who, in actuality, are young werewolves learning how to hide their wolfishness from the world at large. Kevin's American anthropologist parents have enrolled him in St. Friard's to be close to him while they conduct their research. Since Kevin is a foreigner, he's assumed to be a werewolf and he's lodged with that population. He doesn't realize that his schoolmates are werewolves. He befriends Alex who is a year younger and at the age where he's first able to change into a wolf. Alex, of course, assumes Kevin is a werewolf like himself. Over time, they learn each other's true natures. The Hammer of Anubis is an ancient Egyptian cult dedicated to exterminating werewolves. And the wolves can't even defend themselves. An aversion treatment each cub receives at an early age makes it absolutely impossible for them to attack humans--even if it means their lives. Agents of the Hammer see Kevin in boy form after having seen a wolf running through the bush. They deduce that Kevin is a werewolf. After a suspicious airplane accident involving Kevin's parents, Kevin runs away from school in an attempt to visit his father. Alex, who has become Kevin's best friend, goes with him. In the hostile Australian desert, Kevin and Alex face thirst and hunger and also the agents of The Hammer who are out to kill them. The success of my two tier pricing policy ($4 or Free) for my anthology 'SF++ Science Fiction Stories for Linux Geeeks' has led me to employ it here as well. But, since it's a kid's book, I'm making it $3 or Free. While I would be delighted were you to buy the book from Amazon or Barnes & Nobles, you may also get it at no cost by simply requesting a copy. Email for your free copy: Kindle (MOBI) or Nook (EPUB). I'll e-mail the book to you within a few days. In the unlikely event that I'm flooded with requests, it might take a little longer.